It’s time for you to decide… Vote for your favorite below. 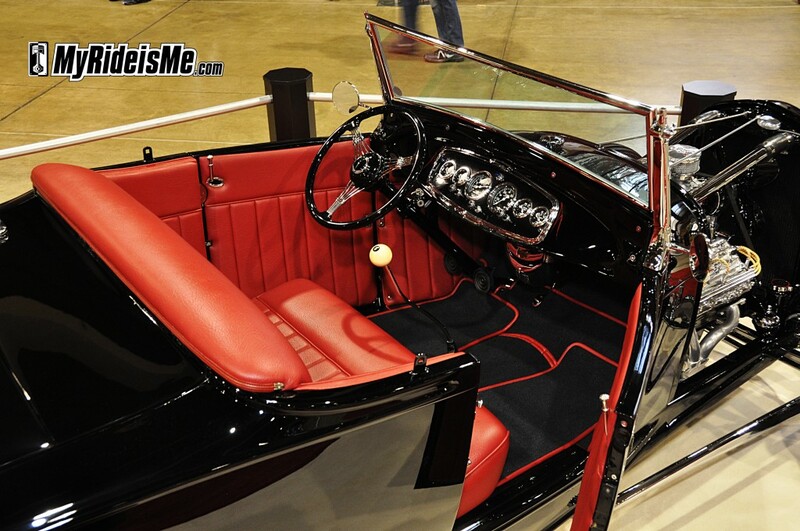 Did you come here looking for the winning roadster? 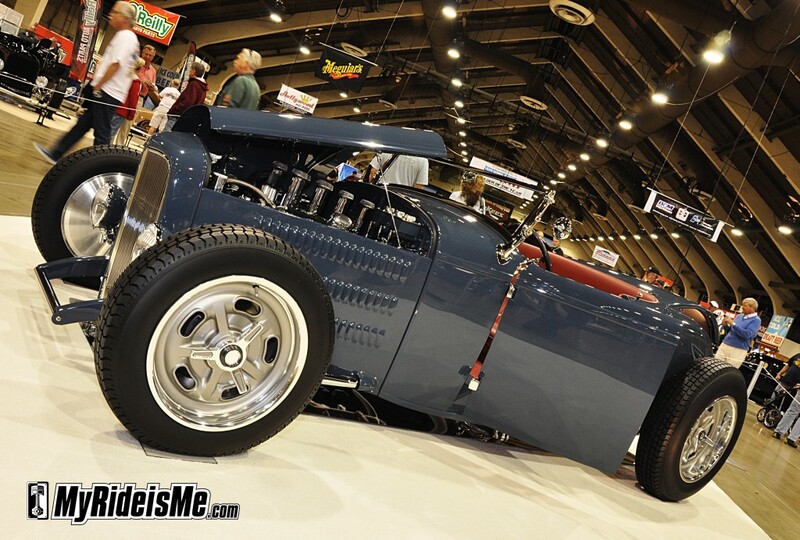 This one’s the “Indy Speedster” owned by Bill Lindig from Houston, TX. 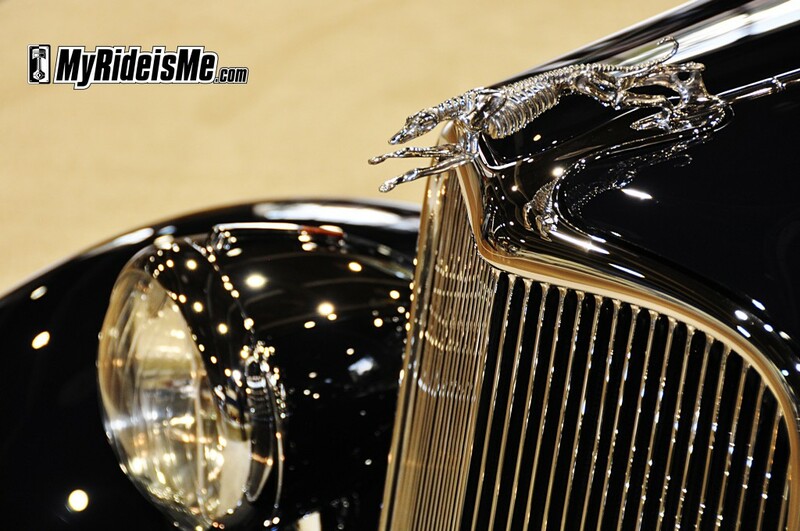 When you’ve heard someone say there’s, “Too many details to list” this is the car they’re talking about. 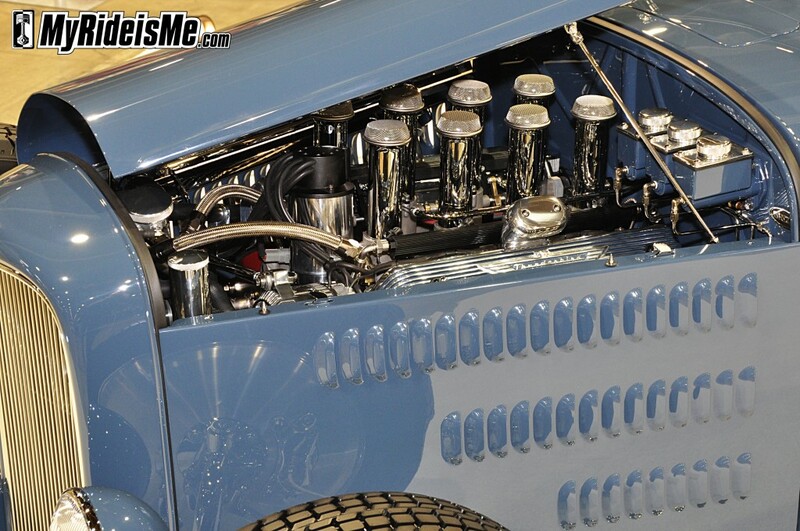 Start with a hand-made aluminum body, sprint car style and torsion bar suspension all around then top it with an Art Chrisman build 352 cubic inch Ford backed by a Tremec 5 speed. 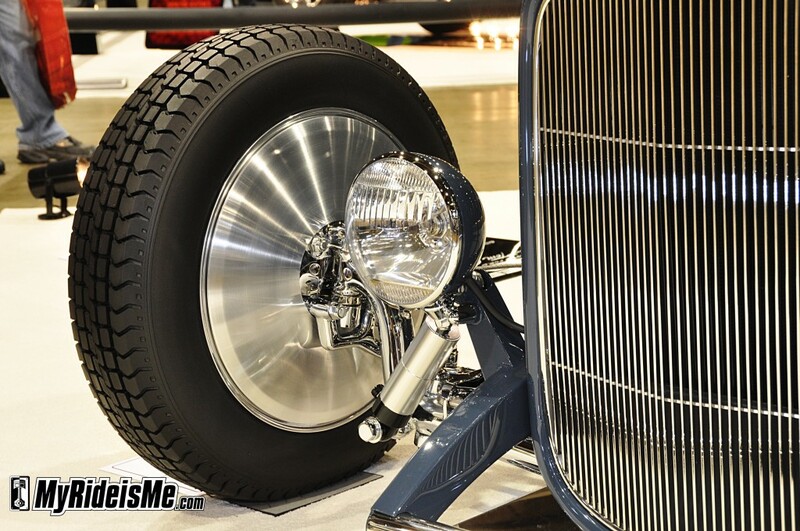 Look for a feature story on Bill’s SoCal Speed Shop built speedster tomorrow. “Sylvester III” Three? You know there’s a story there and we aren’t disappointed. 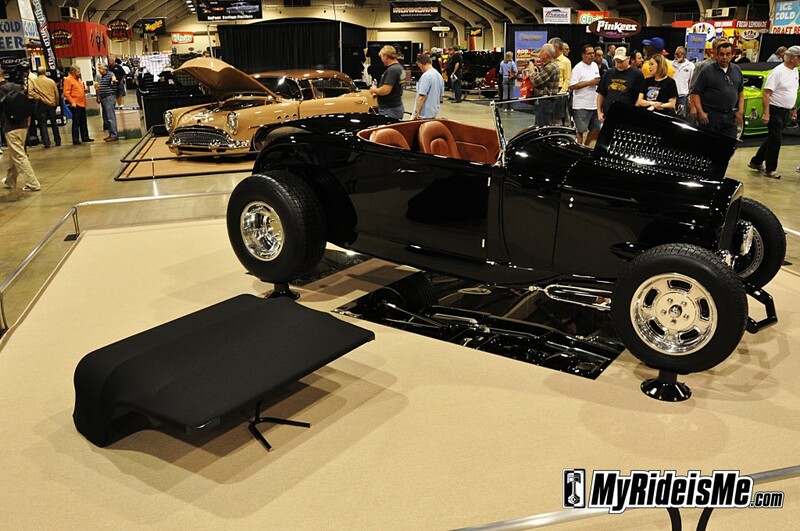 This 1932 Hot Rod Ford roadster is original 50s customized steel resurrected by the guys at New Metal Kustomz. 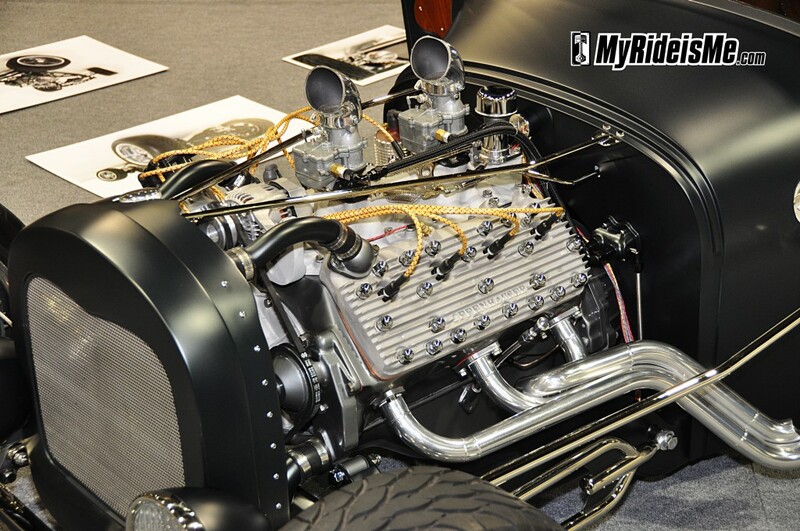 The show card says the original Sylvester debuted at the 1962 Grand National Roadster Show, but since then has been, “… traded, sold, disassembled, and stored for 40 years.” Nowadays, the 401 Nailhead powered hot rod wears some slick looking, and cream filled, headers. You know for the new rules, the AMBR cars must be driven in. 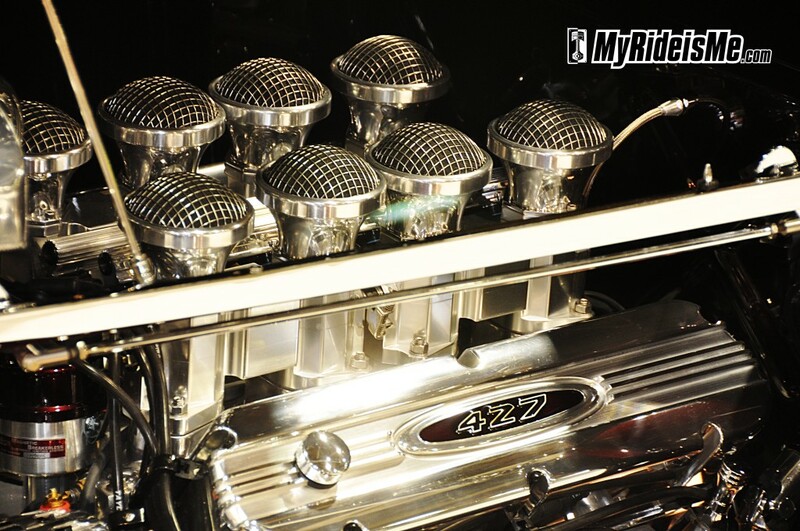 Bet those headers are fun to clean! I’m hoping for a feature on ole’ Sly this week for more of the story. This just in! 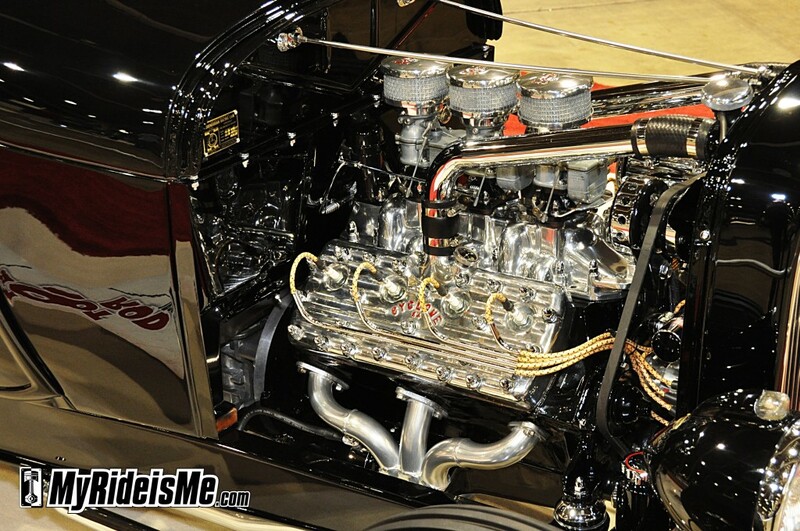 Sylvester won 3 big time awards at 2012 GNRS: Best Paint, Best Engine and Best Undercarriage. 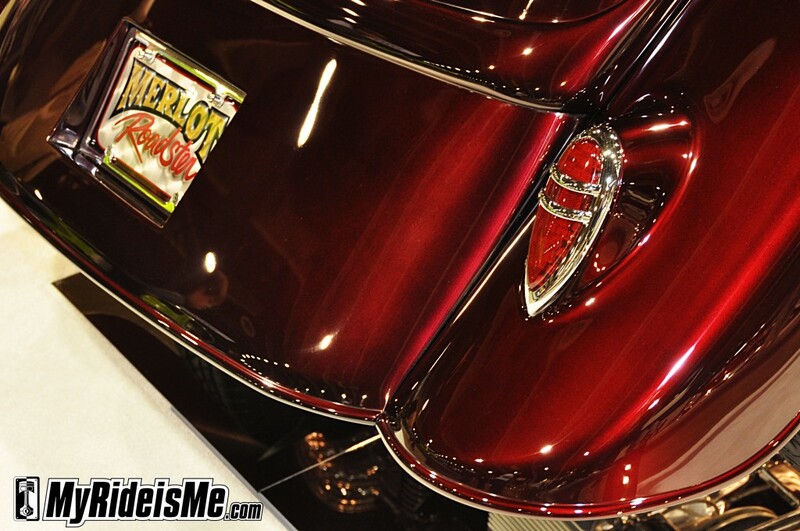 Congrats to owner Paul Shaughnessy who’s also the chief at New Metal Kustomz in Cotati, CA. Winner for best nickname, I give you, “Speed Racer”. 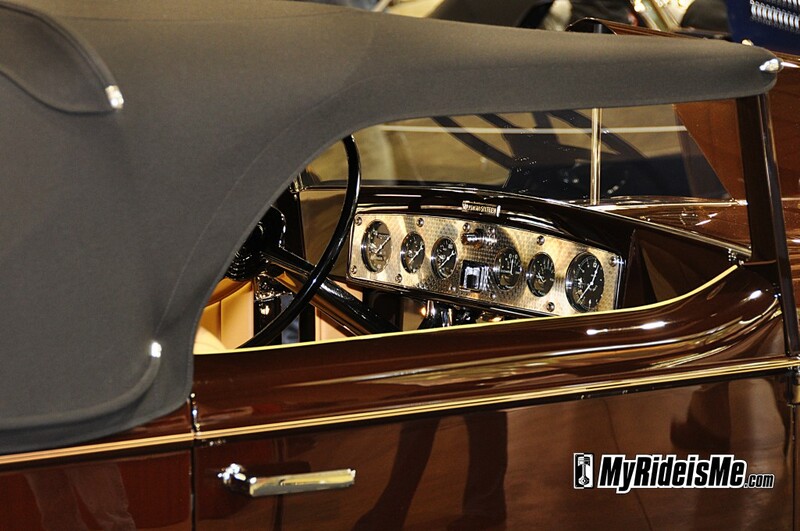 Owner Tom Glory explains that his buddies were giving it to him cause he didn’t own a 1932 Roadster. 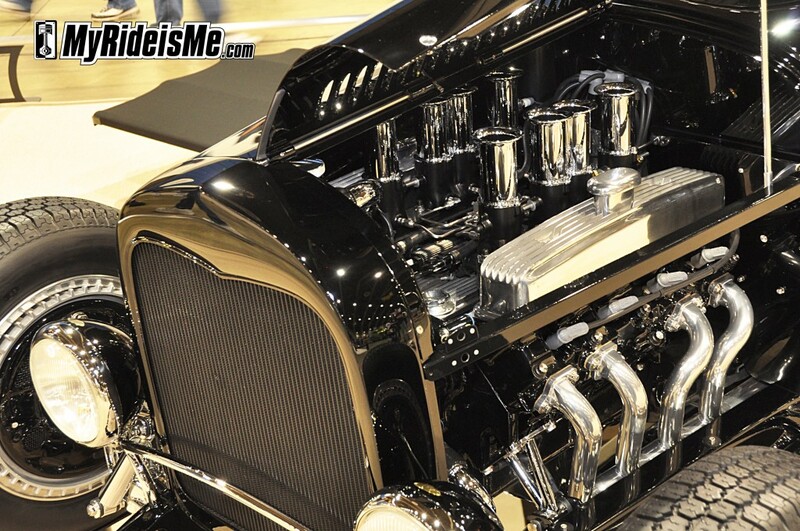 (My friends bust on me cause my cars don’t run, but anyway, back to poor Tom) Tom didn’t want, “Another 32 Roadster” and started rattling off how it’d be built for the Bonneville racer in him… and be channeled, but the right way. With Roy Brizio from Brizio Street Rods involved, this Edelbrock Ford 302 powered and manual shifted hot rod is now running wide open at GNRS. 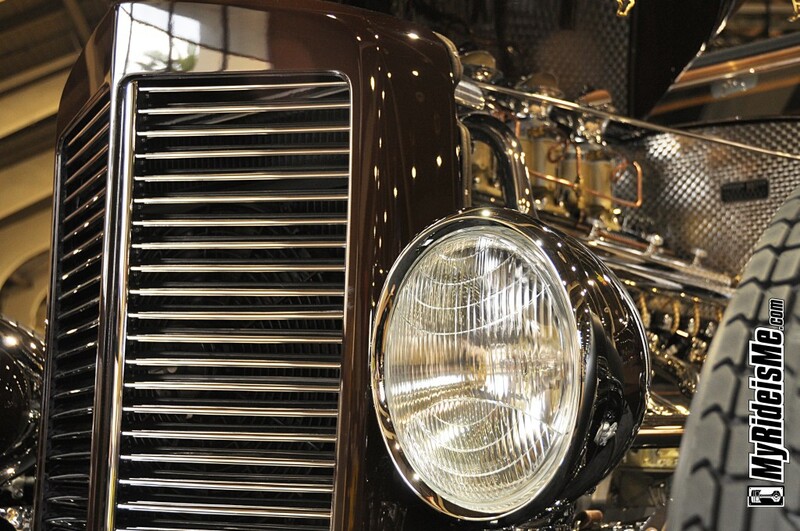 Number five should be number one when we’re talking unique and different powertrain. 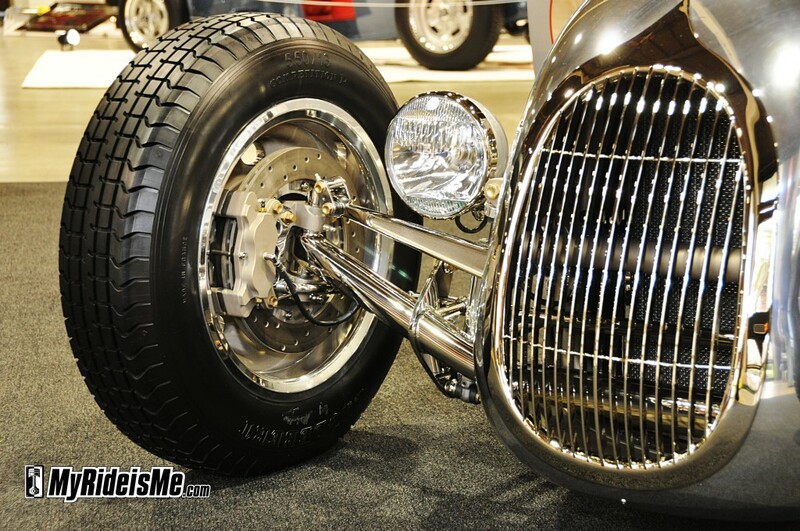 This 1932 Ford hot rod roadster, named the “Riley Roadster” is motivated by an early example of overhead cam technology from Riley Racing. And guess what? 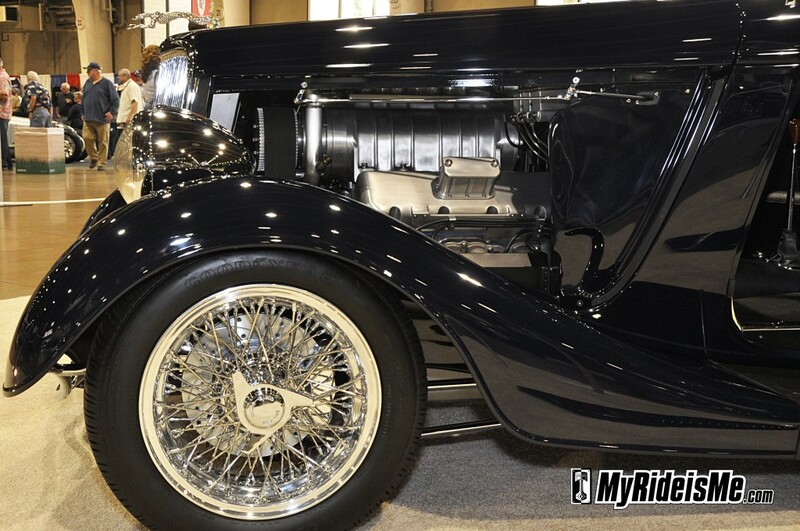 We’ve got another 5-speed, not to mention another quick change rear, but this one’s a prototype from Riley with overdrive. Here’s a case where we need some video of this thing running. The car is owned by Don Smith, but I’m hoping for an interview with the Argentine race driver who pilots this thing. Anyone know Juan Fas Boogar? We know who the traditional hot rod crowd will be voting for. 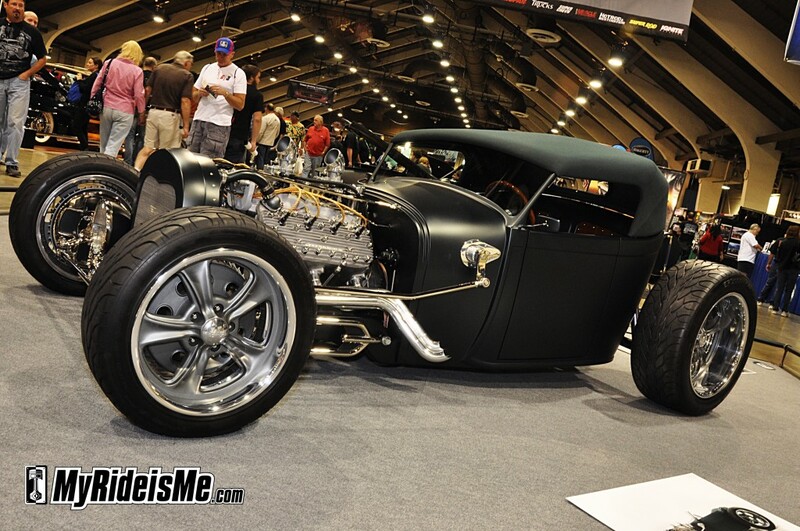 No nickname here… it’s just a Hot Rod 1928 Ford Roadster with all the go-fast tricks of the day. 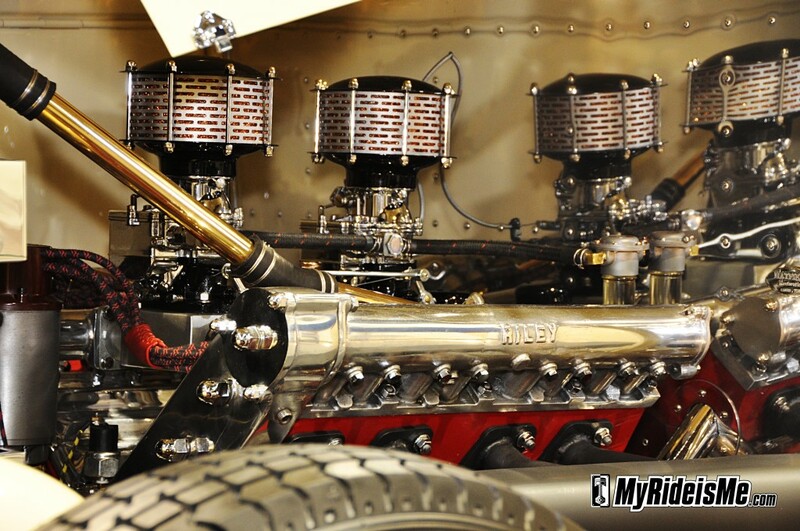 The full house Mercury flathead by Very Tardel is not shy on plating by McKenzie Plating in Oregon. Want another great reason to vote here? 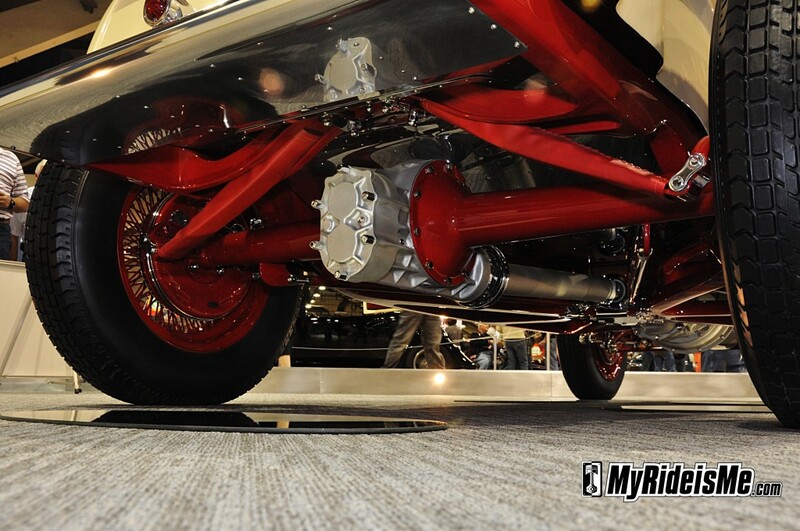 Owner/builder Keith Christopherson did all the work on his roadster in his home shop. 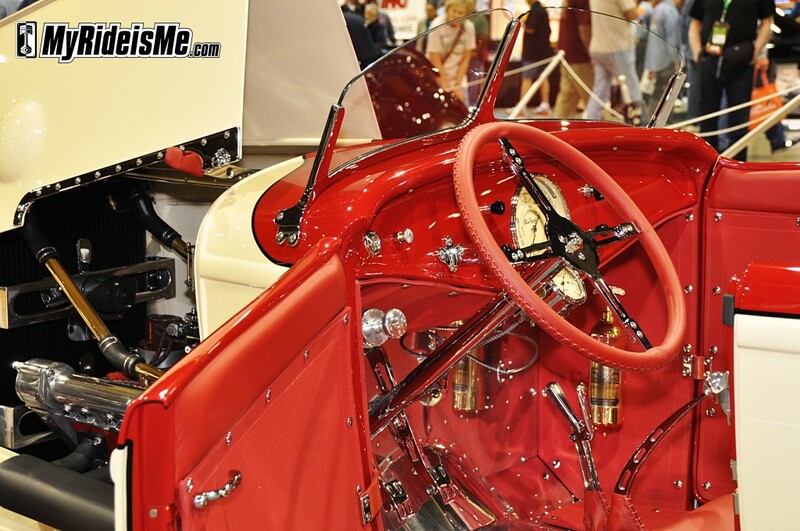 That’s including the chassis, bodywork, painting, plumbing and “just about everything else.” He also remembered to especially thank his bride, Brenda on his show card. Smart, skilled man indeed. We’ll have to let the pics do the talking here. 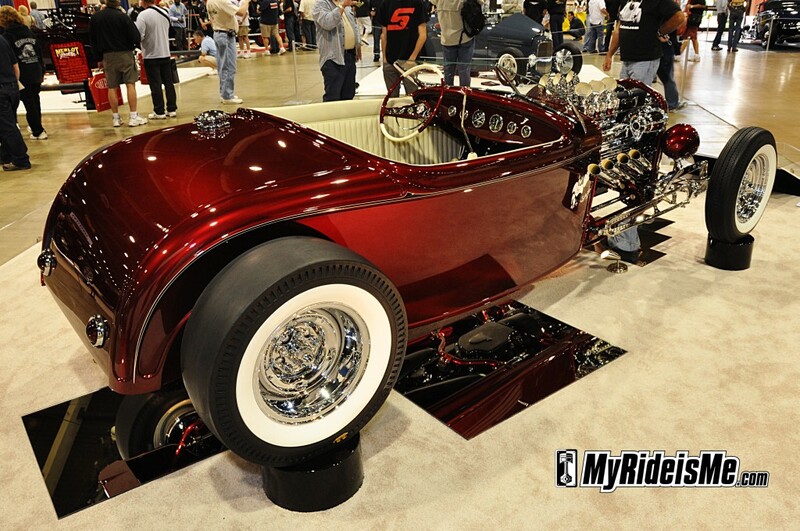 427 Ford, fuel injected power and some dry “Merlot” coat this 1933 Ford Roadster owned by Steve Lyman from San Juan Capistrano, CA. I suspect owner Hayden Groendyke from Enid, OK has one of everything. 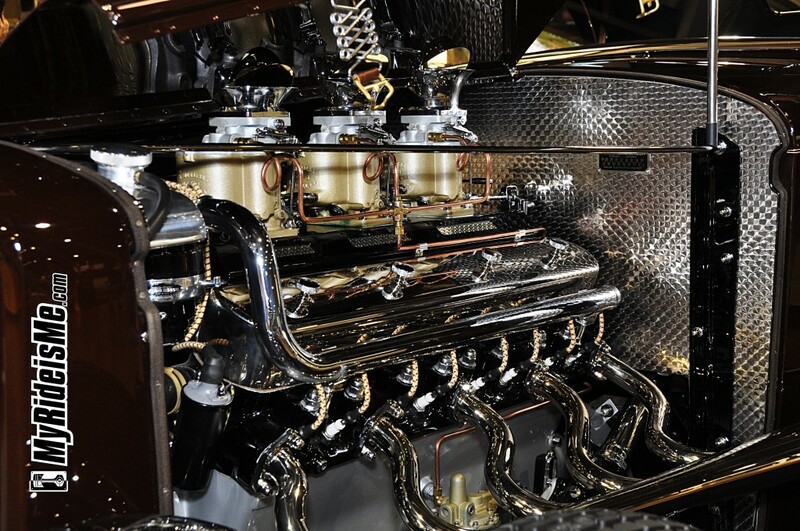 That’s the only reason I’d imagine he had the Hot Rod Garage from Sands Springs build this V16 powered 1931 Marmon Roadster. 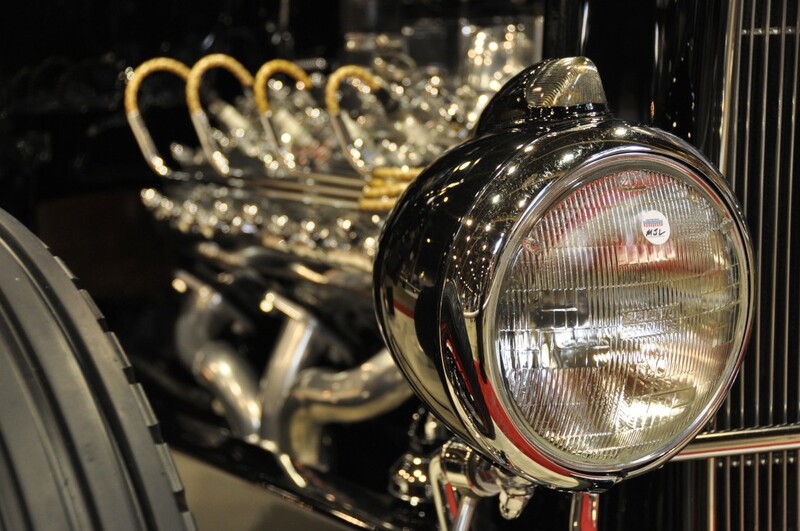 Hayden got to know the engine-turn guy well with details pouring out behind every chromed piece on this size extra-long 2 seater. 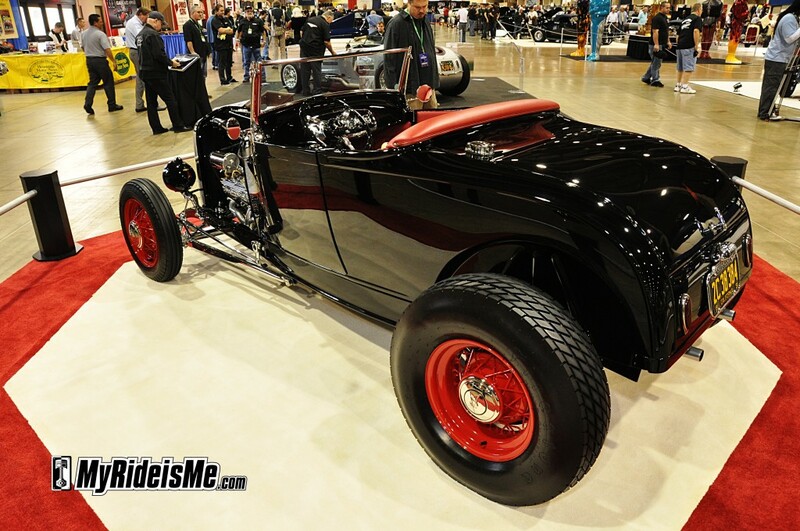 The other Texas contender is this 1929 Model A Ford roadster done up in gallons of black laid out by Danny Zoeller and motivated by a Hilborn jammed 425 Nailhead rowed by another Tremec 5 speed. 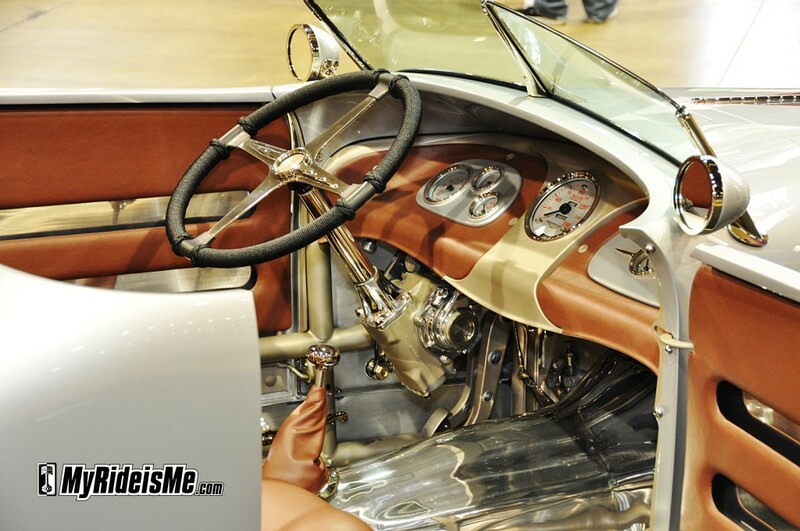 No doubt manual transmissions are the first choice of America’s Most Beautiful Roadsters builders. Does this fine machine have a nickname? You gotta have a nickname! 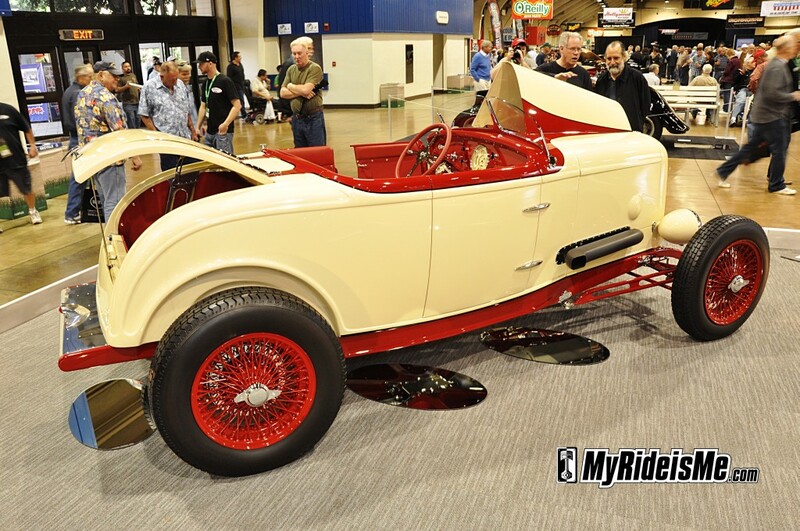 Simply known as “29 A Lakes Modified” owners Larry Reynolds and Linda Ford made it easy to drop some details on this Kenny’s Rod Shop built Boise, ID hot rod. The first and obvious thing you’ll notice is the flat paint from PPG. 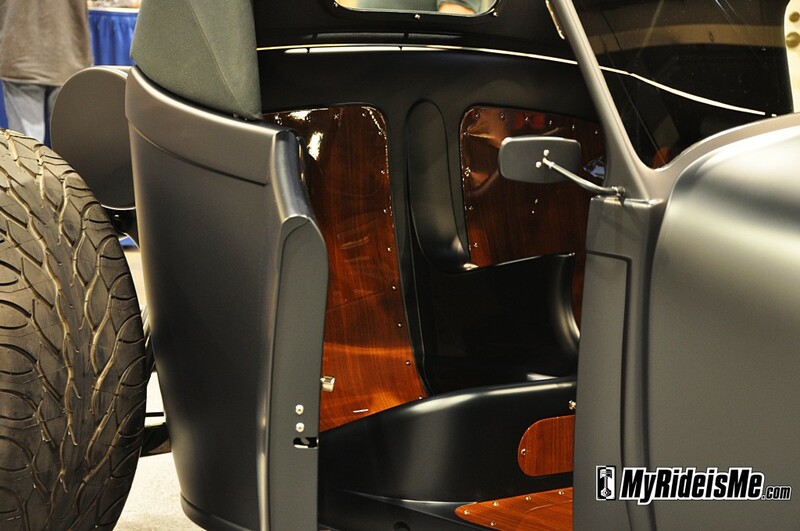 BMW Oxford Green (in water base) is topped by Lamborghini flat clearcoat. 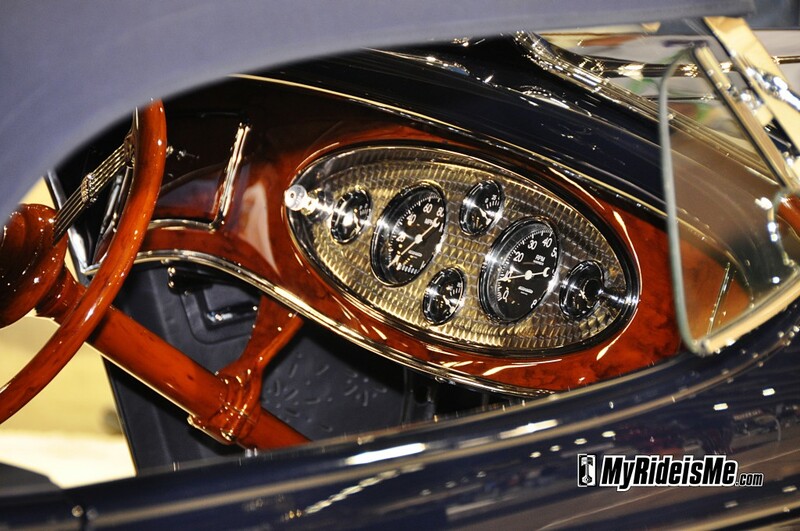 Could you have guessed this model A modified had a piece of Italy on board? 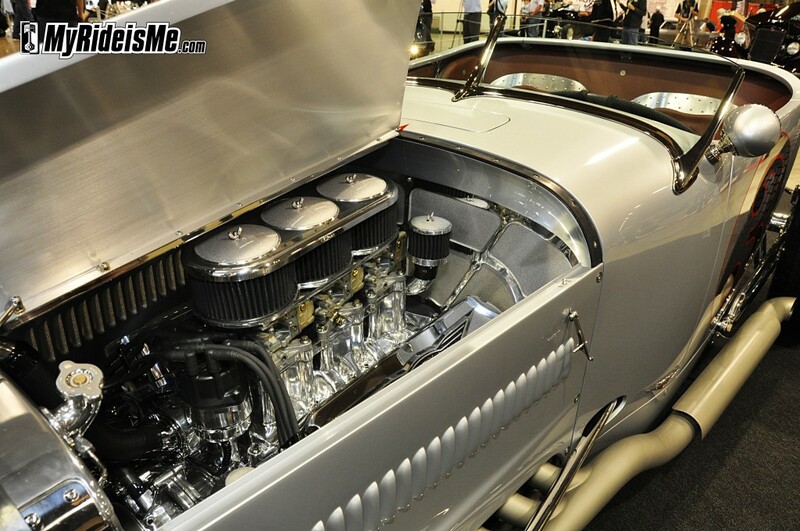 A Mercury flathead moves a C4 automatic, maybe the first auto in the crowd? The stop’s provided by our new friends at Wilwood with disc brakes all around. If you’re curious about the official rules, click this link for the new rules for last year: Read about the new AMBR Award judging rules. Other than that… tell us what you think! By your vote and by your comments, tell us who should win and why. 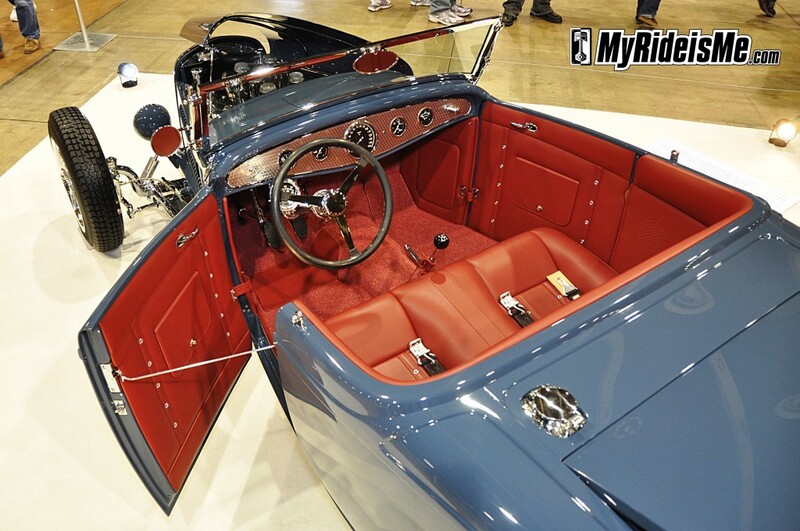 #4 Blue 1932 Roadster, "Speed Racer"
#5 Cream colored, "Riley Roadster"
Hmm. Competition at the top is pretty even. I think the win will go to the Brizio built “Speed Racer” #4 on this list. To me it evokes AMBR. 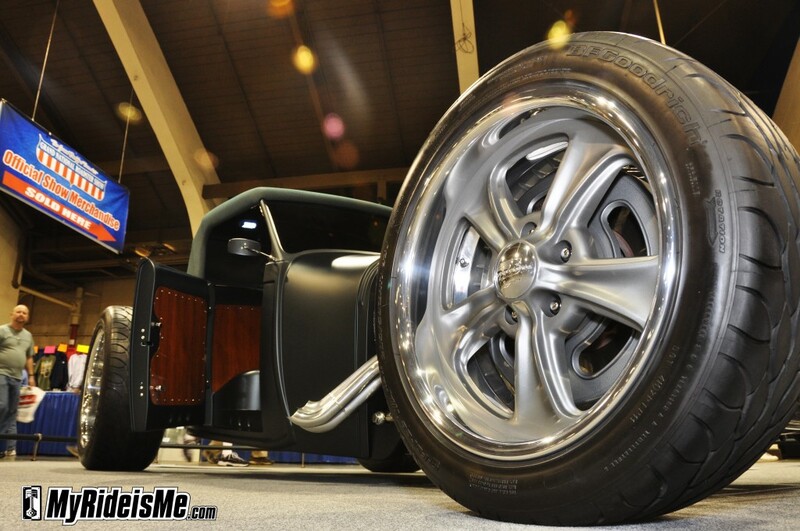 The SoCal built aluminum roadster is nice, but lends itself more to “race car” than “roadster”. 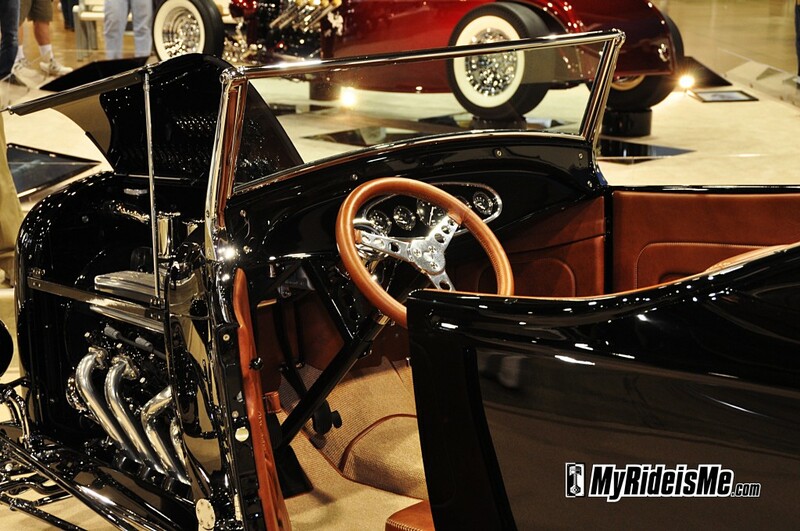 My personal favorite is a little black ’29 Ford on ’32 rails with Halubrand wheels and a Buick nailhead for motorvation. 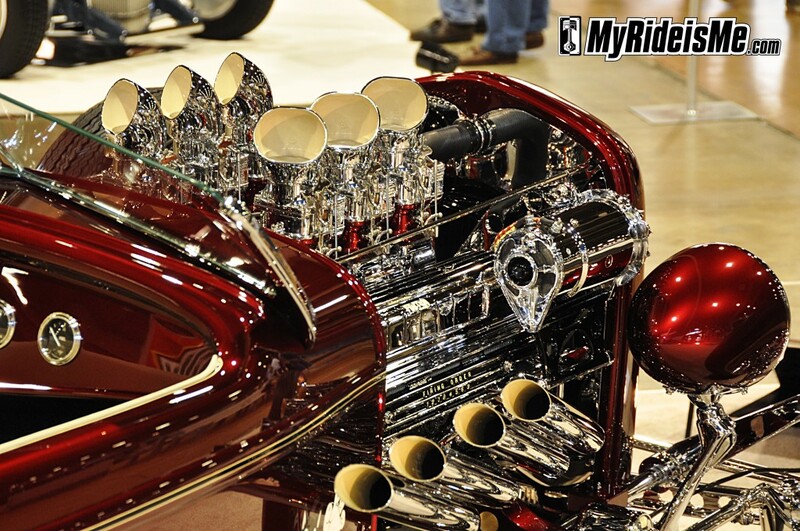 I don’t think it has enough “wow factor” to compete. The little Lakester built by Kenny’s Rod Shop, is cool, but I’m thinking the judges are going to not score it well based on the “flat paint”. 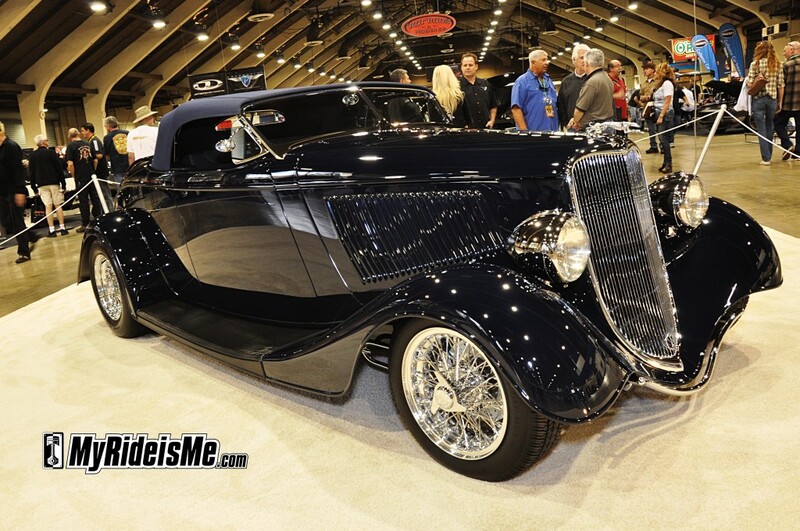 The Moal built ’33 Ford is nice, but understatedly plain-except for the oversize headlights and taillights. 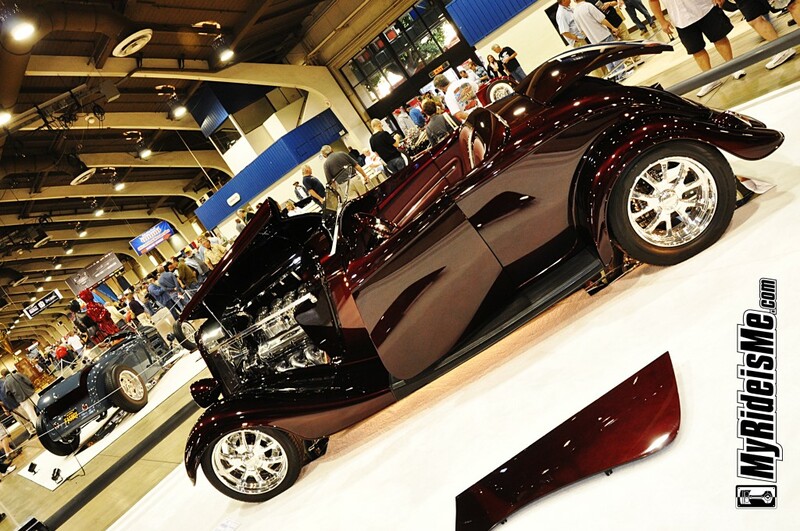 The “Merlot” ’33 Ford is a nice 10 footer. 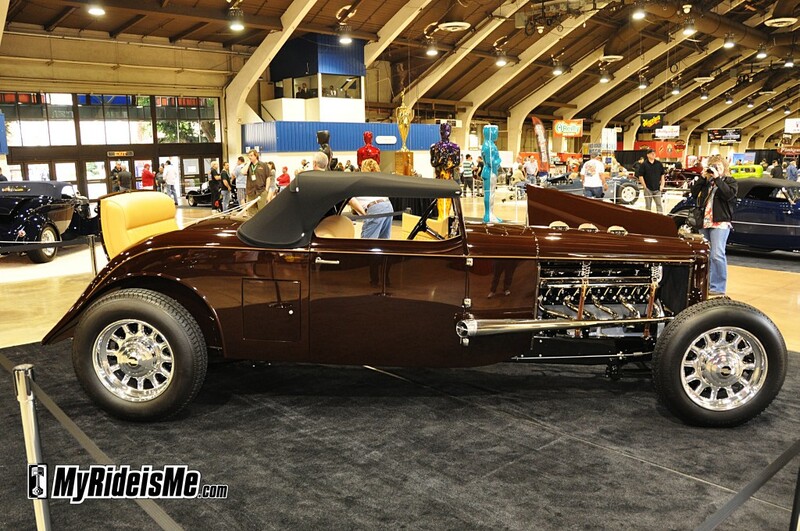 The Riley Racer… Not my thing, but well done. I like several but I know the BLOOD, SWEAT, and TEARS that went into SYLVESTER!!! 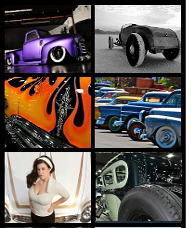 GO Contender #3 – New Metal Kustomz we LOVE YOU!!!! #3 alllllll the waaaaay! Best looking one by far! Sly 3 takes the AMBR in my book!! 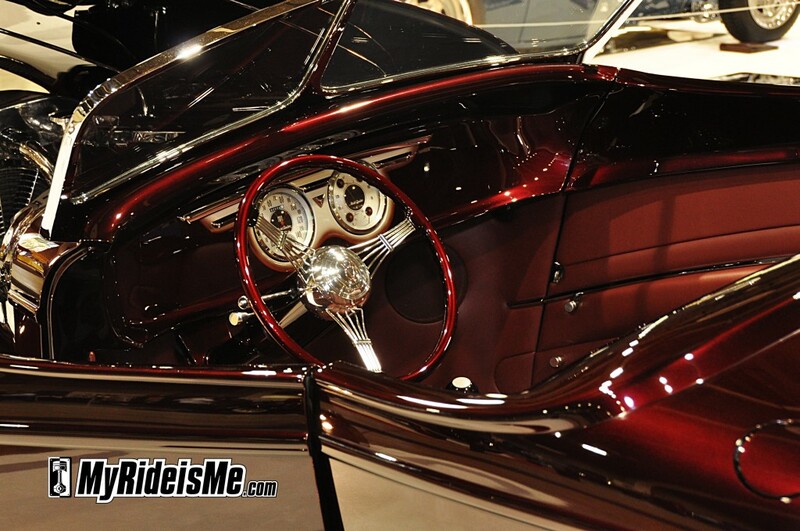 Gorgeous car and great people !! Sure proud of my cousin and buddy Marcus. I think #4 will take it home. Although I wouldn’t be surprised to see #2 take it home either. Remember the owner of #2 Dennis Varni took the same prize home twenty years. Love #3……sure to be #1! I love number 1 with that Race Car Look. It just has todays look. #3 has my heart. Goooooooooooo Sylvester, you more than deserve the prize!!! The candy is no. 3, it captures my eye because it is the winner! 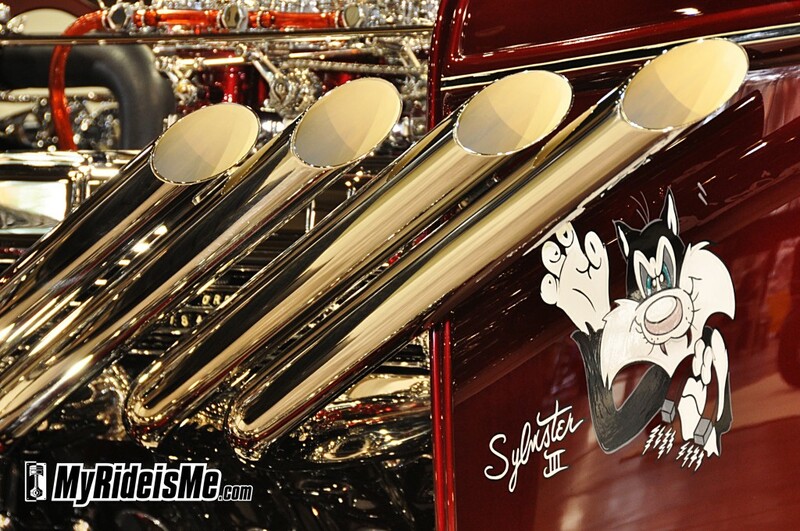 I just heard from the guys that own Sylvester (#3). It won every single other award but AMBR. #2 won that. I call favoritism. Just sayin’. Lauren, here we go! 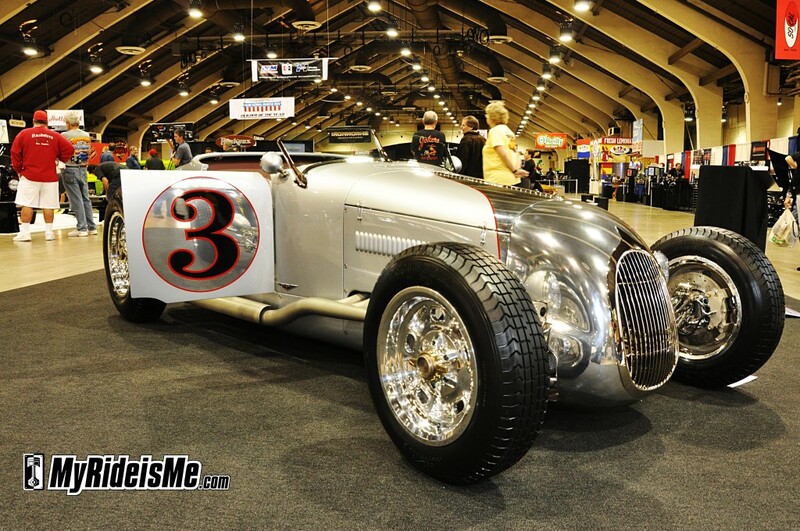 Did you see the “Indy Speedster” that won? (#1 here at the MyRideisMe.com poll and that’s no coincidence). It certainly deserved to win in my eyes. Hat’s off to Sylvester though, I agree, it was the people’s favorite. 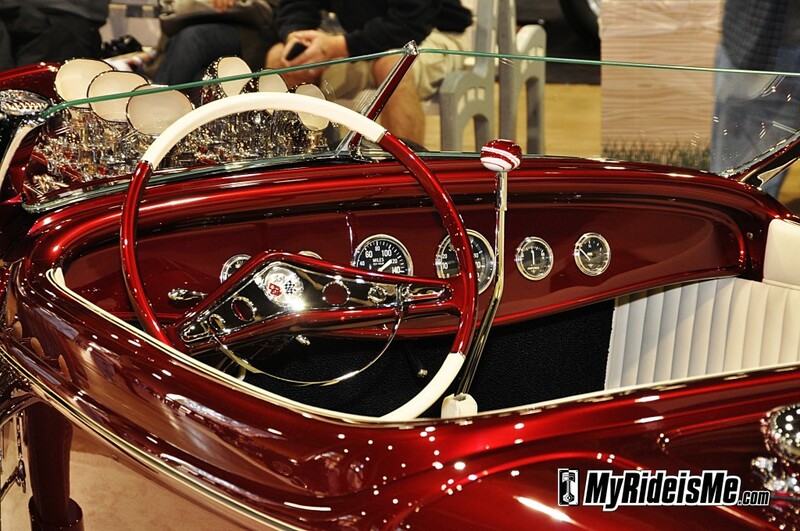 I thought Riley’s Roadster, the Marmon and Sylvester were a step ahead and with more wow factor than number 3. SoCal shop may have had influence on this one. Just glad that another slick piece of over-styled jewelry didn’t win as usual. 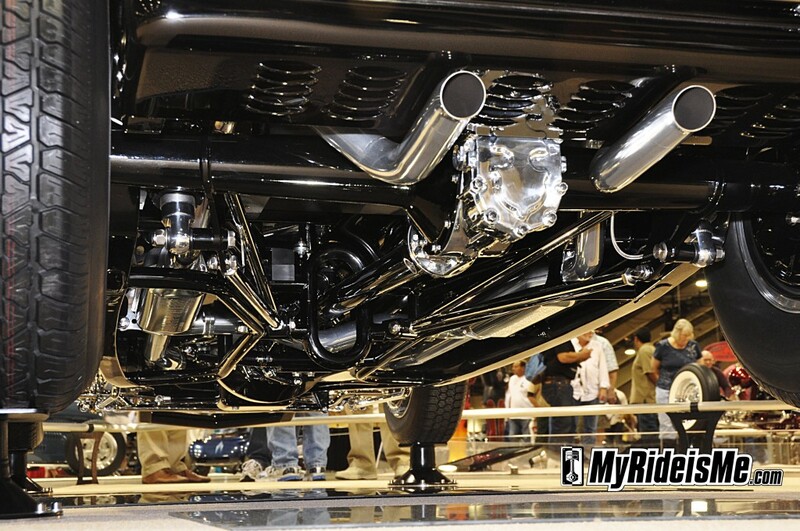 AMBR is all about innovation and originality period. For those who have never seen it…come to México and live the last race of its kind next October 2012…Hualtulco, in the state of Oaxaca, waits for you to visit us. sylvester killed it this year. Its definitly the peoples choice. its AMBR from C.A. to C.T. NEW METAL KUSTOMZ killed it this year. Great job guys. pikesan Sylvester was winning on this pole before the award was announced. You can believe what you like. But the car that won only did so because of So Cal car politics. Hi Lauren, while it’s quite possible politics were involved (aren’t they always to some extent?) the winner was a great car! It’s tough to believe the “only” reason it won was politics. Any evidence to offer?